It’s no secret that Windows 8 will include a radically revamped user interface, which was partially shown off publicly by Microsoft a few months back, yet we haven’t yet seen it in its entirety. Thankfully, Microsoft has accidentally unveiled what Windows 8’s Start menu might look like in an official video showcasing a completely unrelated feature. At the beginning of the video, a new Start menu was visible along the bottom of the screen. While it wasn’t mentioned by Microsoft during the presentation, the Windows 8 team has clearly gone at great lengths to simplify the Start menu, relative to the one found in Windows 7, Vista and Windows XP. Instead of a list of the most commonly-used applications, along with a wide range of user and system directories, Windows 8’s Start menu displays has merely four options: Search, Share, Devices and Settings, as you can tell from the actual screenshot below. While the new Start menu is indeed very simple, it has also arguably reversed some of Microsoft’s user experience advancements in the last few years, such as the introduction of instant searching and a list of most-used applications. Assuming that Windows 8 will just be a colorful clone of Windows 95, however, is a rather simplistic approach: instead, Microsoft might instead be greatly de-emphasizing the role of the Start menu in the new system. Instead of being a condensed dashboard of information and tools, like it has been since its inception, the Start menu in Windows 8 might simply be a list of links, which most of its previous features built more deeply into the operating system’s touch-friendly ‘immersive’ interface. The new start menu was accidentally revealed in a video on Microsoft’s ‘Building Windows 8’ showcasing the system’s new ability to directly mount ISO and VHD files, displaying them right inside Windows Explorer as if they were actual drives. This feature, which has been present in Mac OS X for years, has long been wished-for by Windows power users. Other features unveiled by Microsoft in the past on this blog have been the existence of an App Store, presumably to be built into Windows 8, as well as much-improved file operations within Explorer. 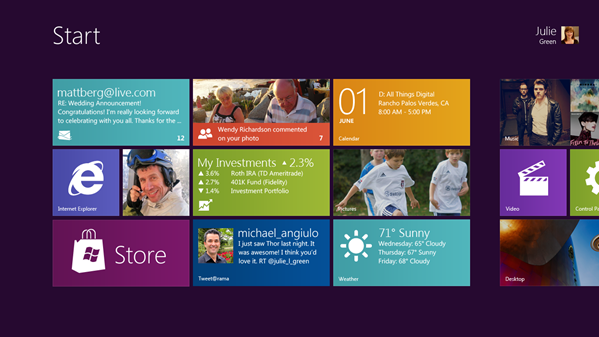 Windows 8 is expected to be unveiled in much greater detail at Microsoft’s BUILD conference, which will take place next month.